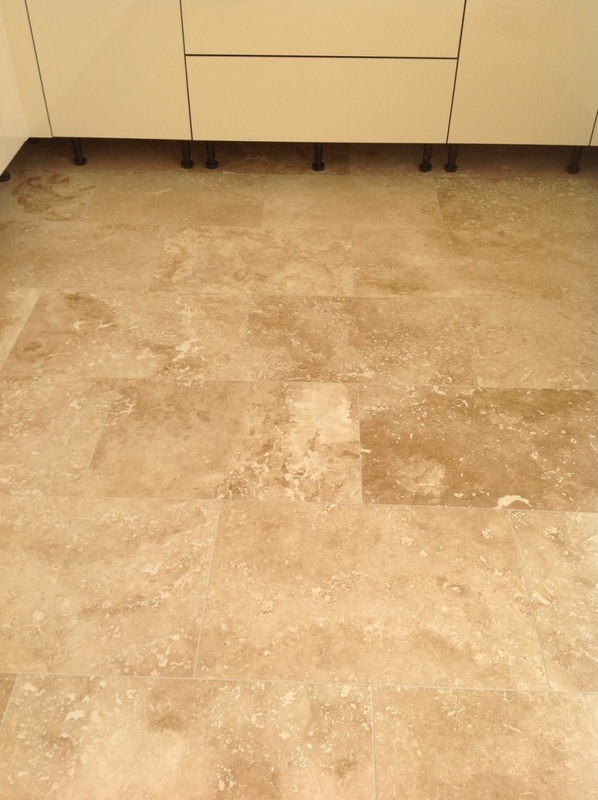 Travertine is a type of Limestone which exists in several variations, including white, tan, and cream-colored. 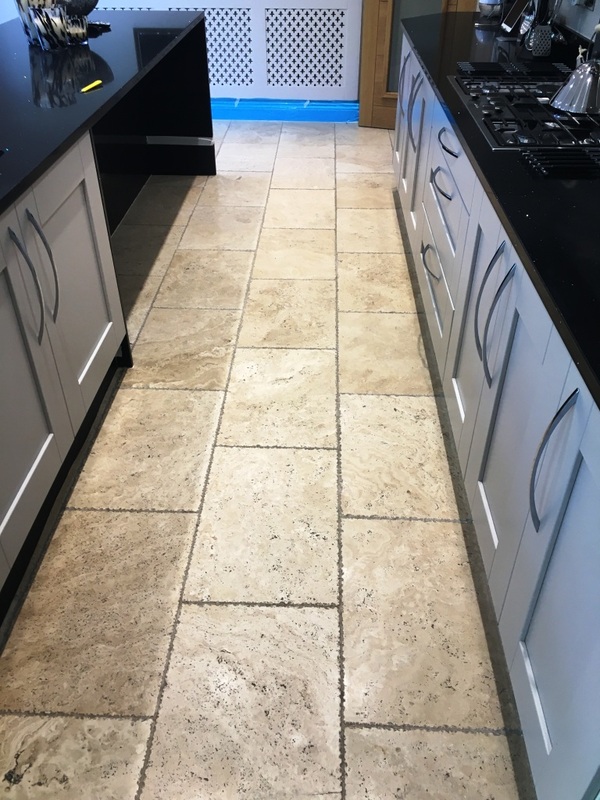 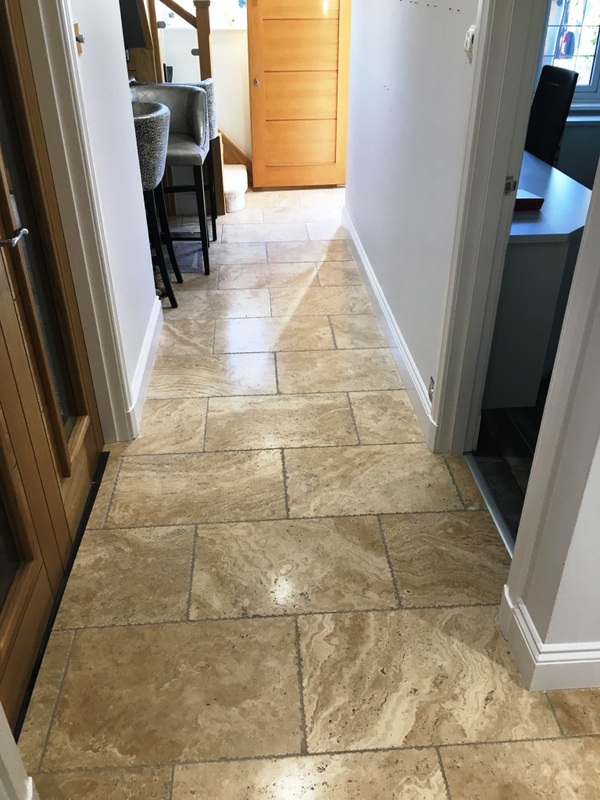 It has distinct colourings and patterns that no other stone can offer and as such it is a very popular choice for tiled floors amongst home owners. 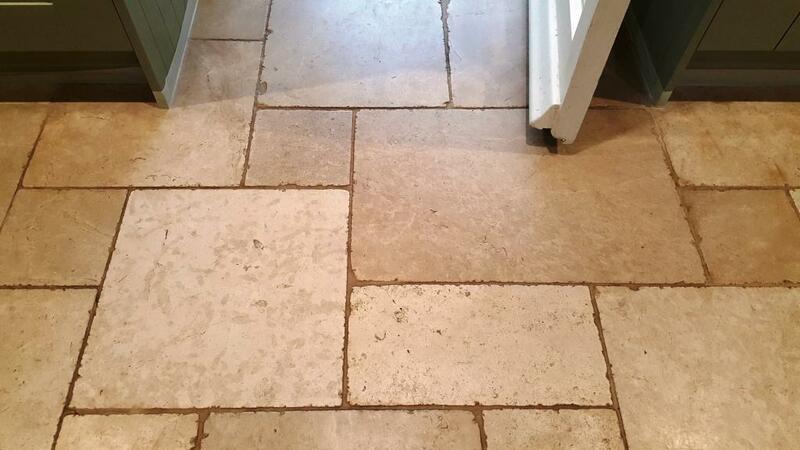 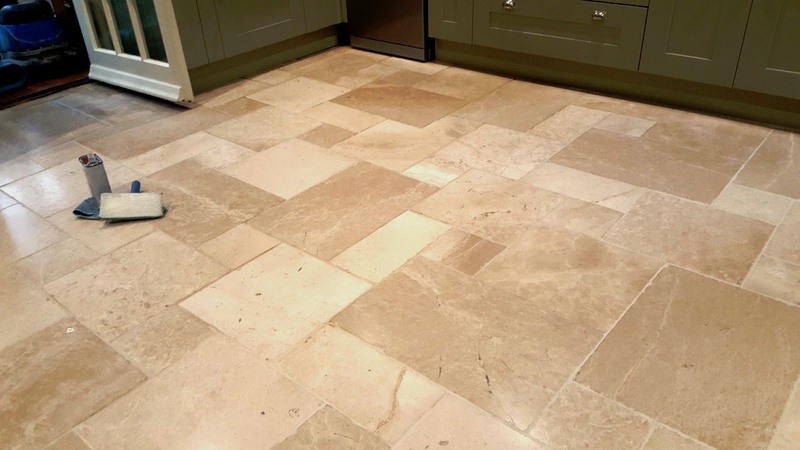 However, Travertine tiles are not the easiest to keep looking at their best. 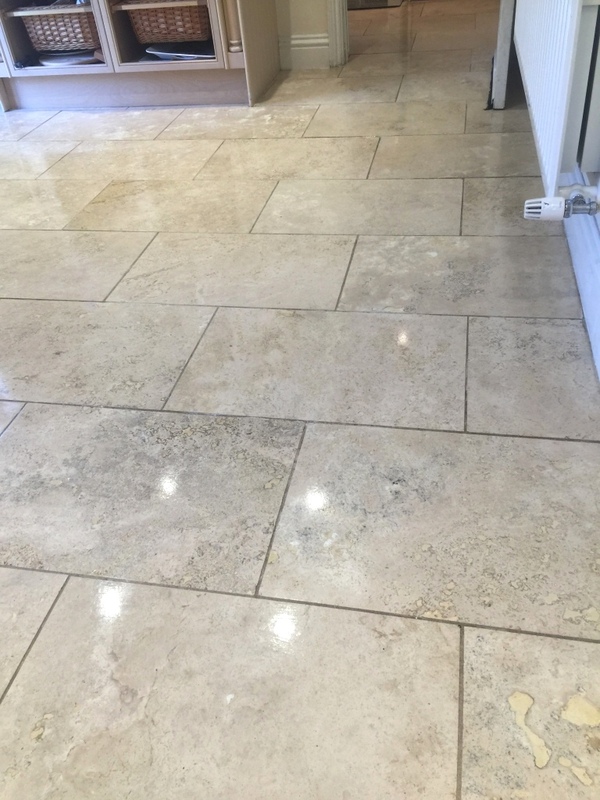 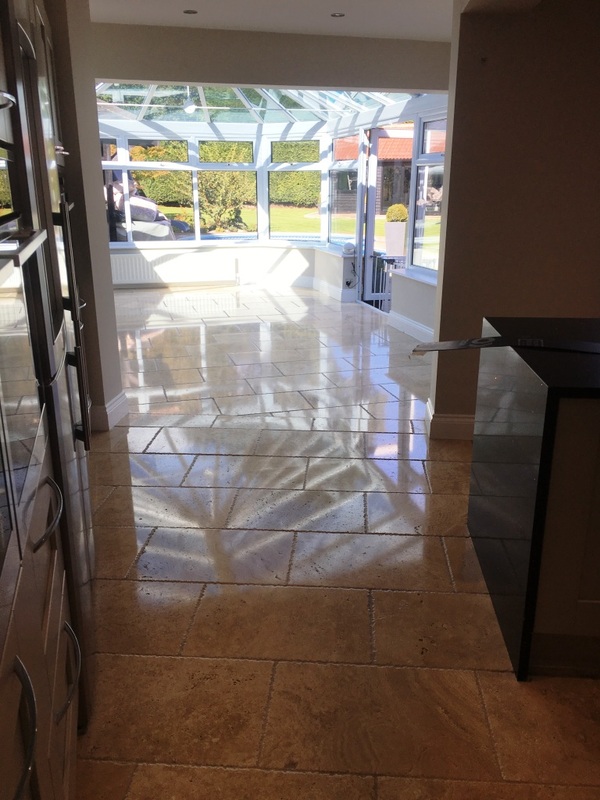 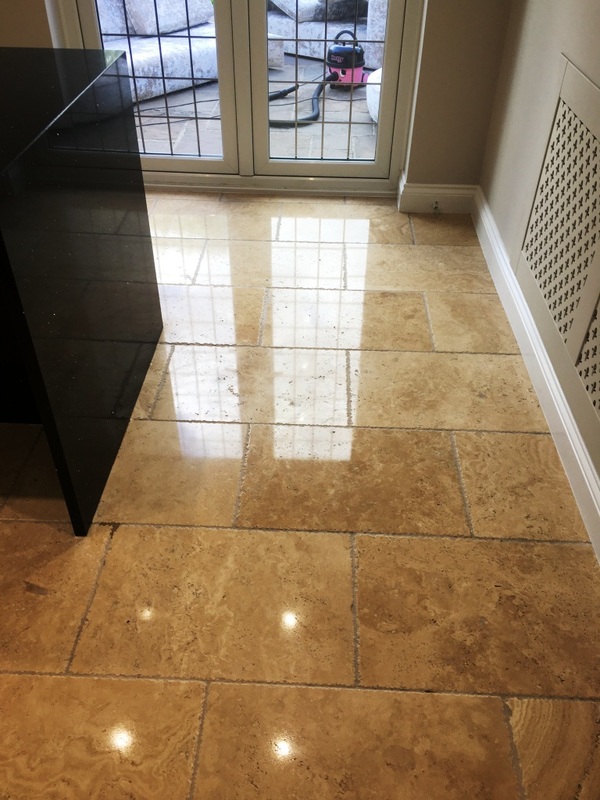 A high-quality polished finish can be difficult to maintain, especially as sealers wear away and all manner of dirt becomes ingrained in the pores of the stone. 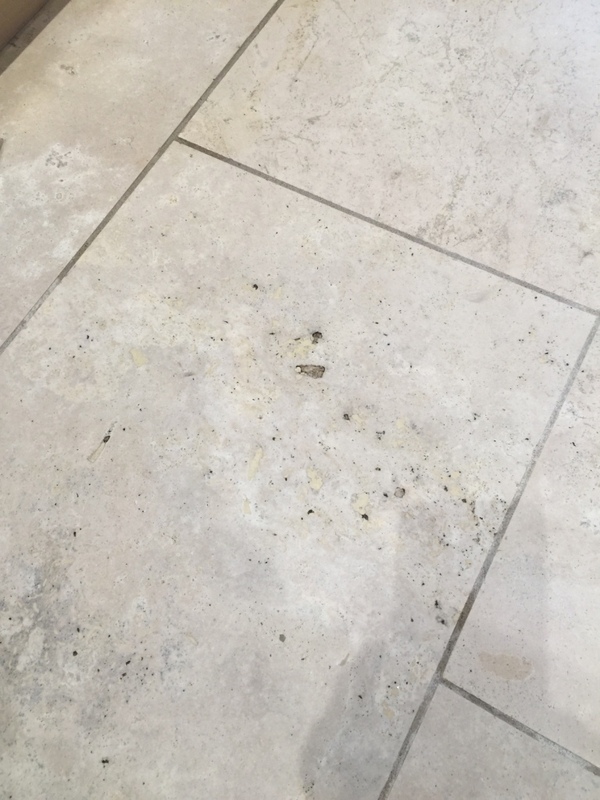 The pictures below were taken at a house in Cambridge where the owner had this exact same problem and requested my help to get them looking their best again. 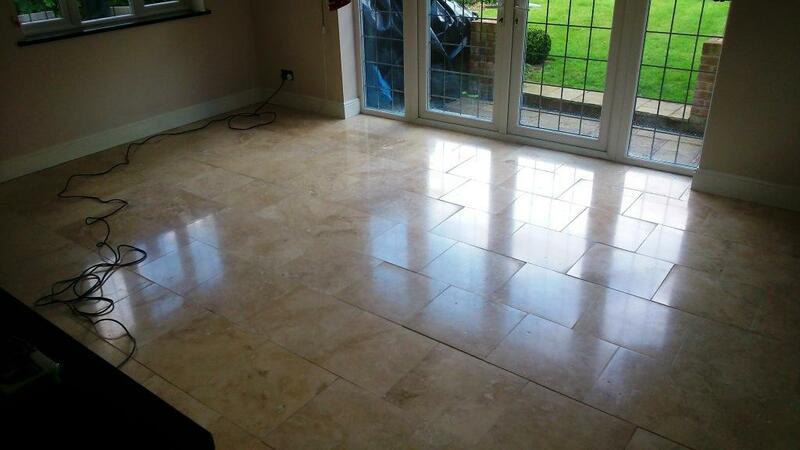 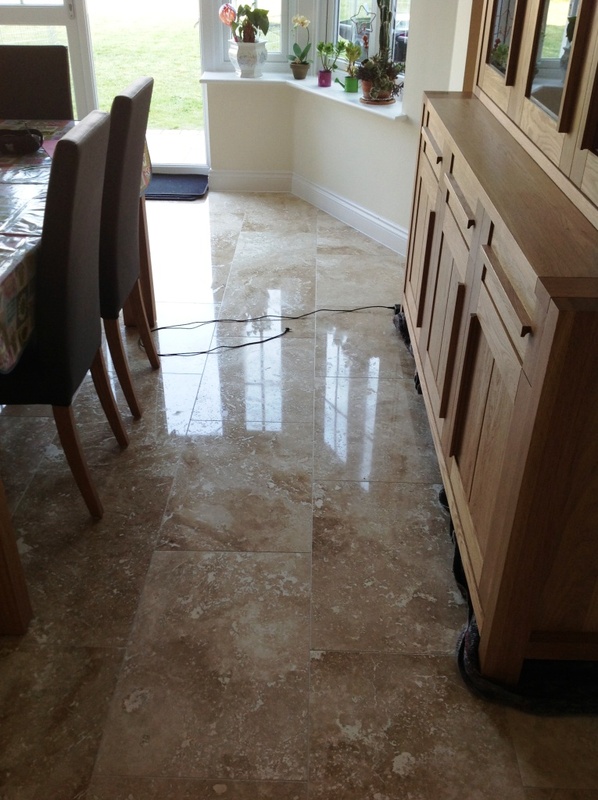 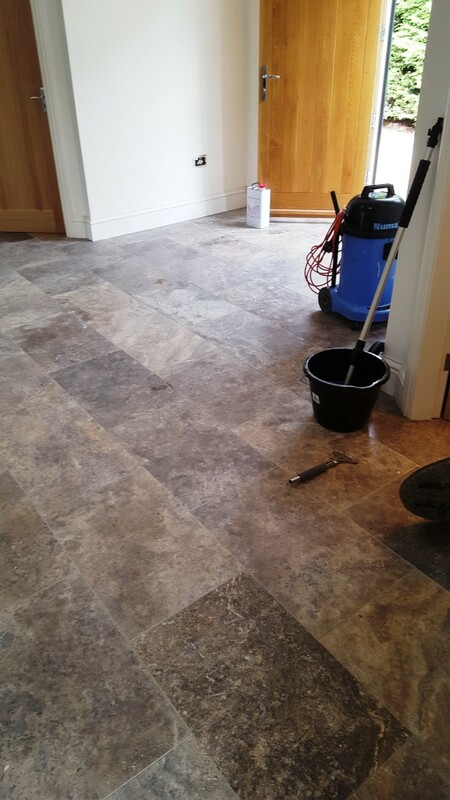 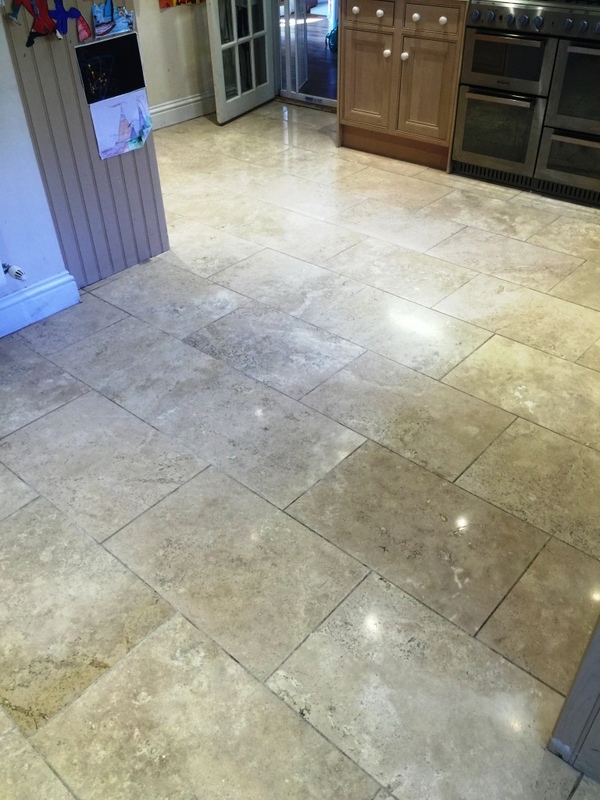 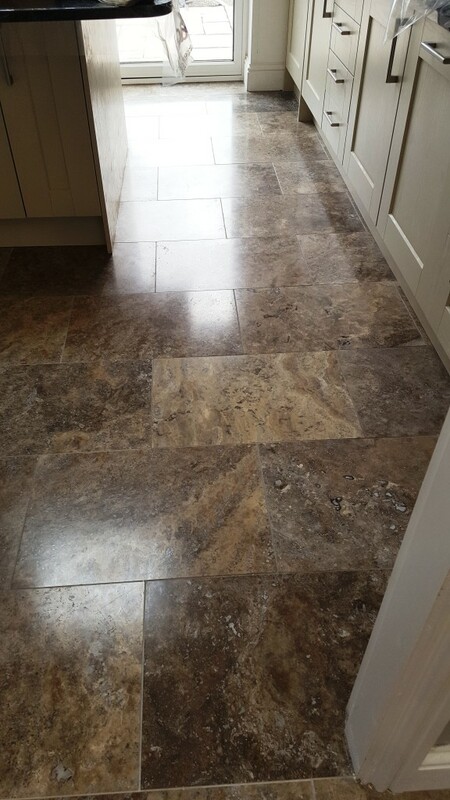 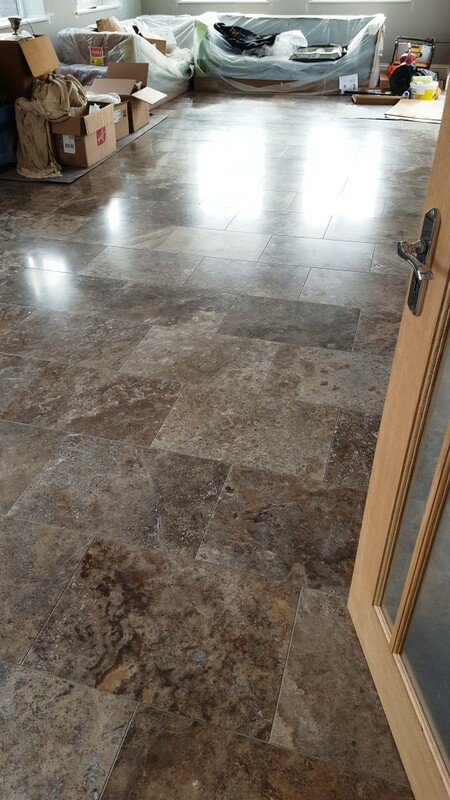 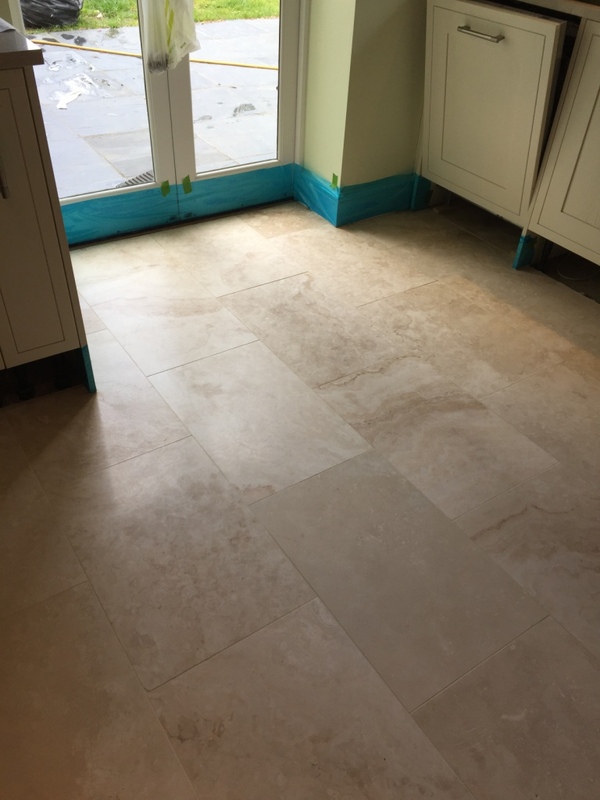 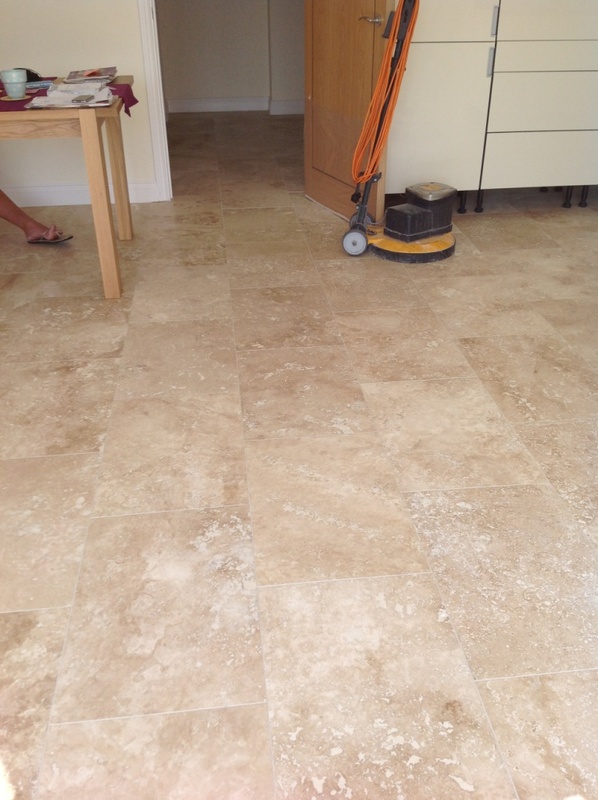 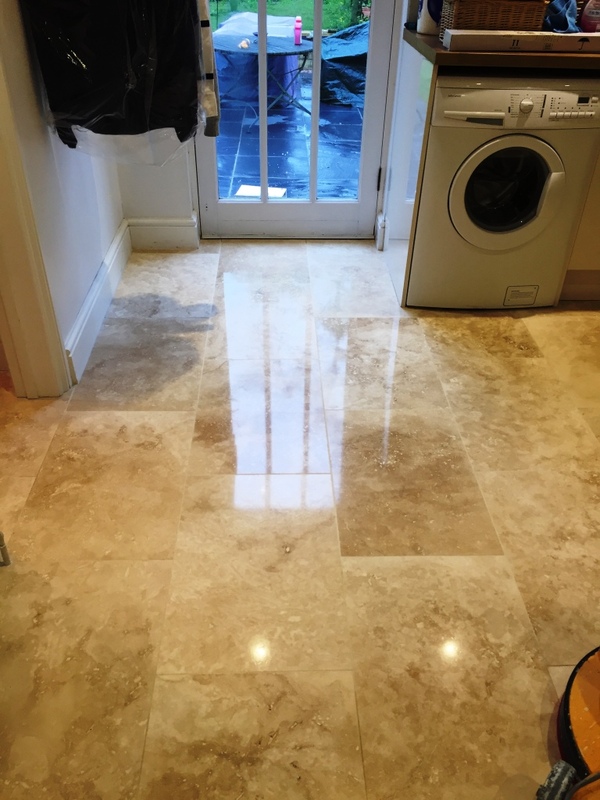 The Travertine tiles had been installed across most of the entire ground floor of the house, including the kitchen, dining room, living room, office and utility room. 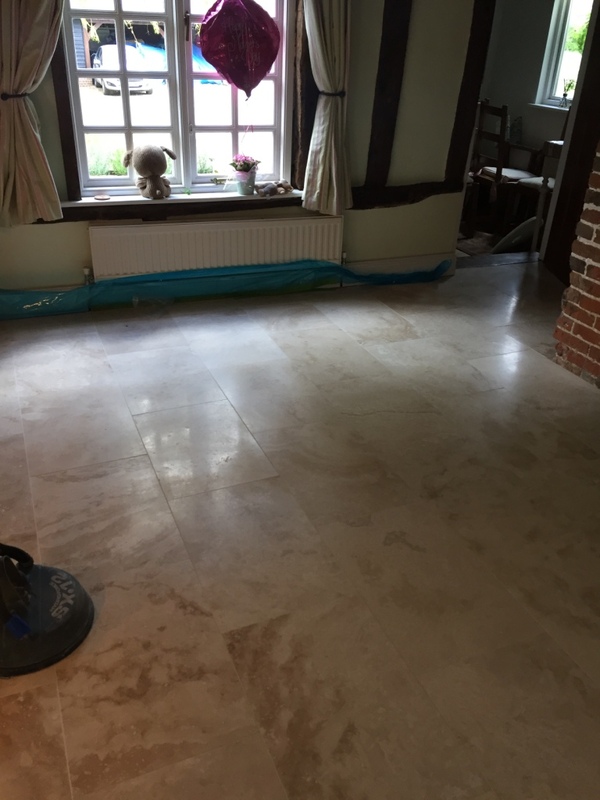 The owner was not happy with the current appearance of the floor because the shine and reflectivity that had once existed had gradually worn away. 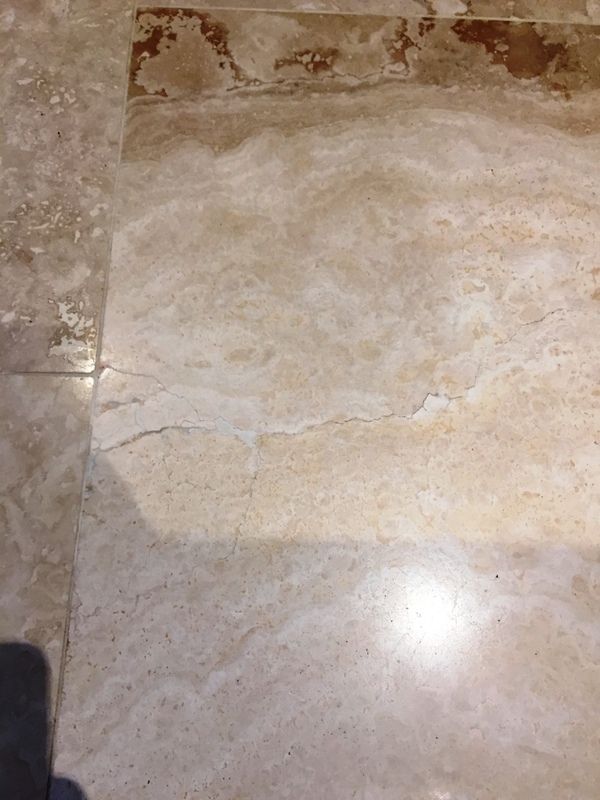 The floor was also littered with many pitted holes (caused by natural erosion) and a few cracks which would need to be filled. 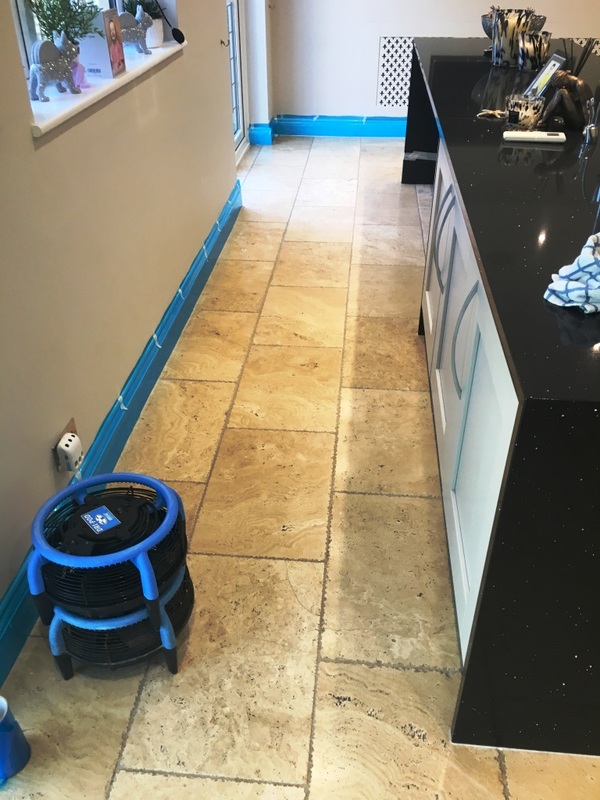 My first step in restoring the tiles was to remove the kick boards from around the kitchen and utility room, before masking up all walls and wooden units with protective décor film. 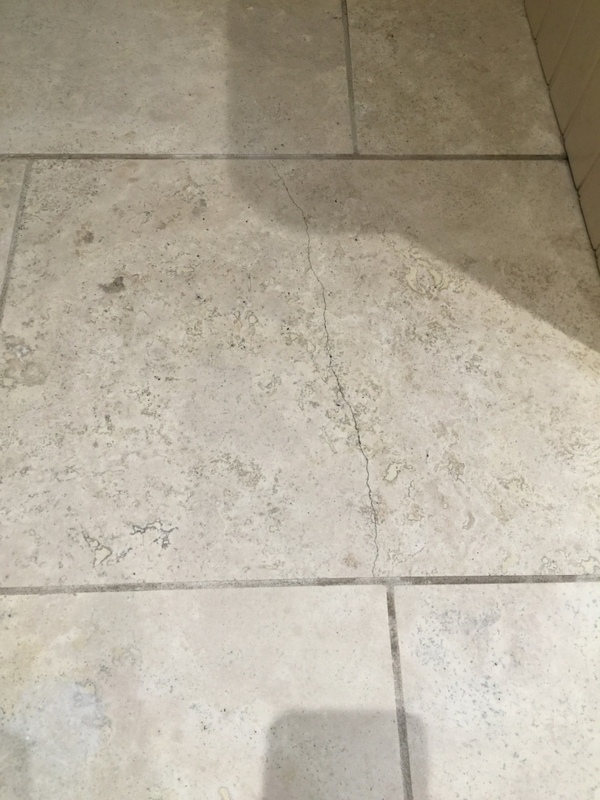 This was done to prevent these areas from encountering any cleaning product. 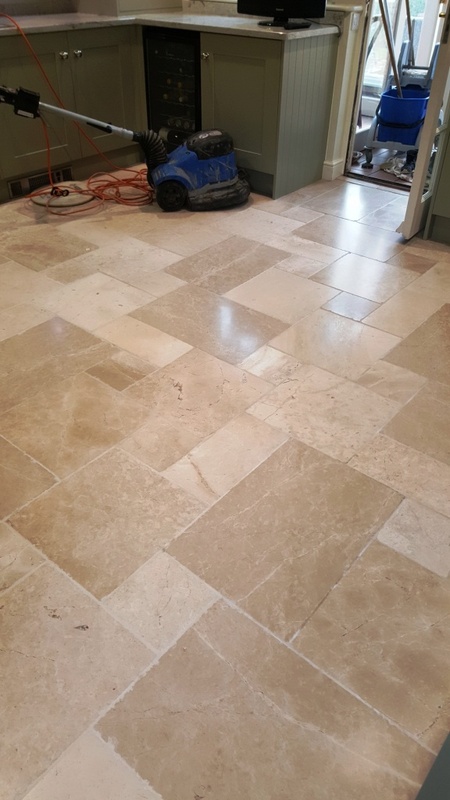 Next, I began the cleaning process by applying Tile Doctor Pro Clean across the entire area and worked it into the stone using a scrubbing brush fitted to my rotary machine. 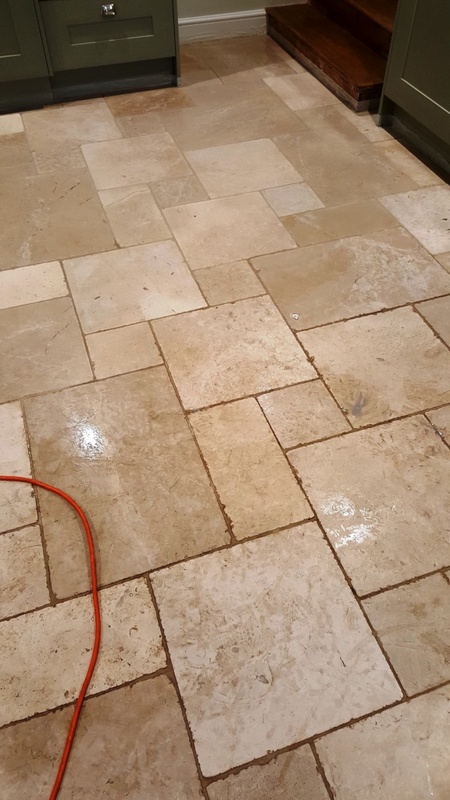 This high alkaline cleaner broke down any old sealer while also relieving the stone and grout lines of any ingrained dirt. 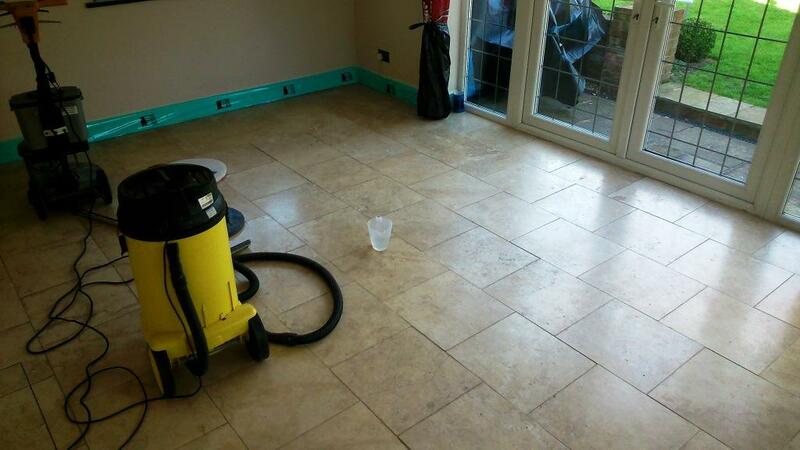 After the initial clean, I used the Tile Doctor system of four diamond encrusted burnishing pads on the tiles. 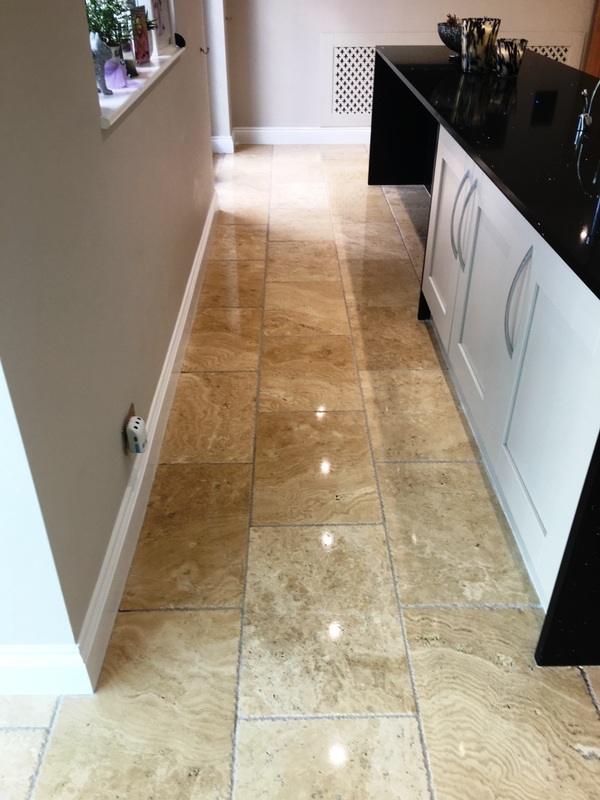 Burnishing is a form of polishing that involves gradually honing the surface of the stone, first by applying a Coarse grit pad, followed by a Medium, Fine, and finally a Very Fine grit pad to achieve a high quality polished finish. 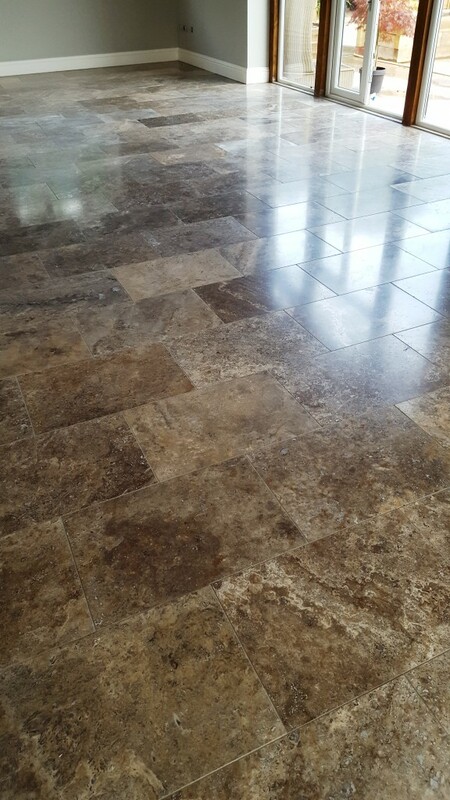 The system uses a little water for lubrication and the floor is rinsed between each pad to remove the soil so it can take some time to complete especially on a floor this size. 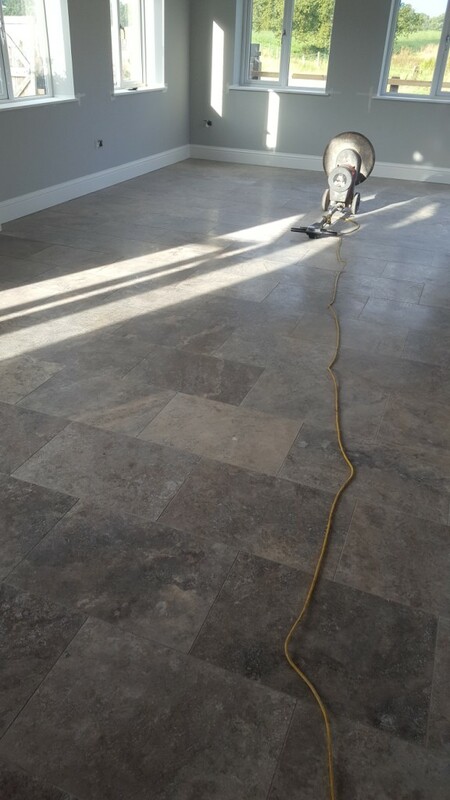 Once I was done I filled in the pitted holes and cracks with an appropriate resin filler before applying the Very Fine pad. 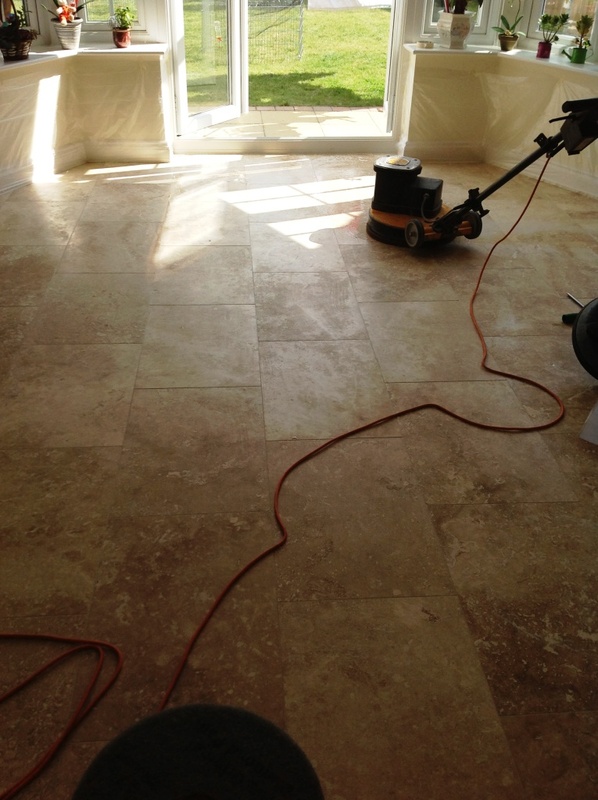 To finish the restoration, the tiles needed to be sealed. 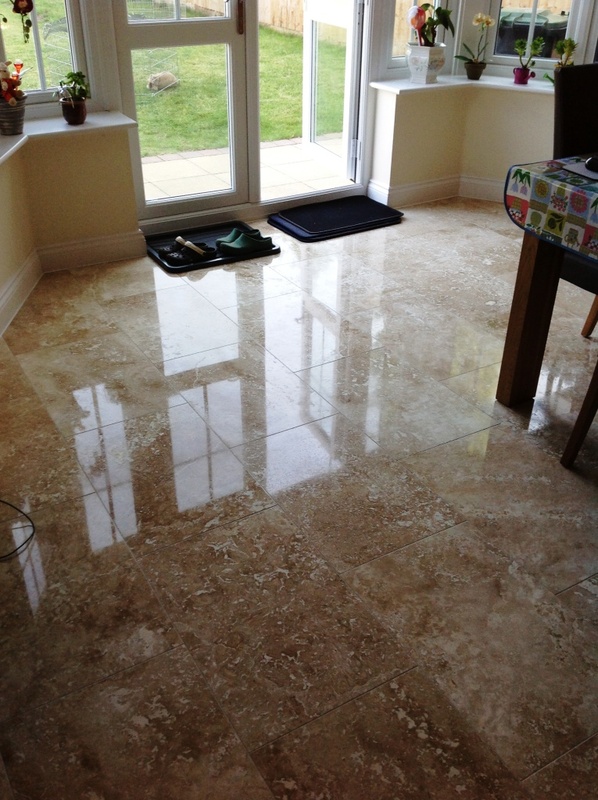 I did this firstly by applying Tile Doctor Shine Powder, which is natural sealer in a crystallising powder form. 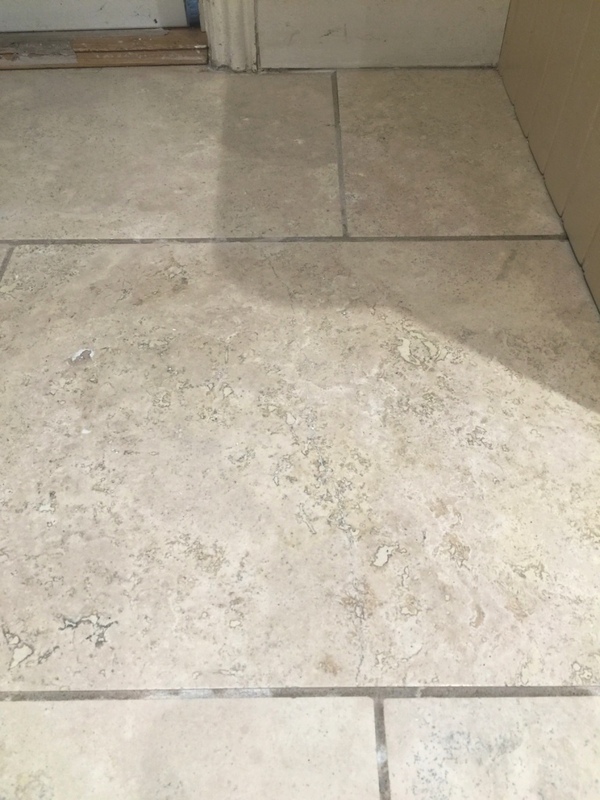 I applied it using a white pad and polished the tiles to provide the very high shine and tough durable finish the client had requested. 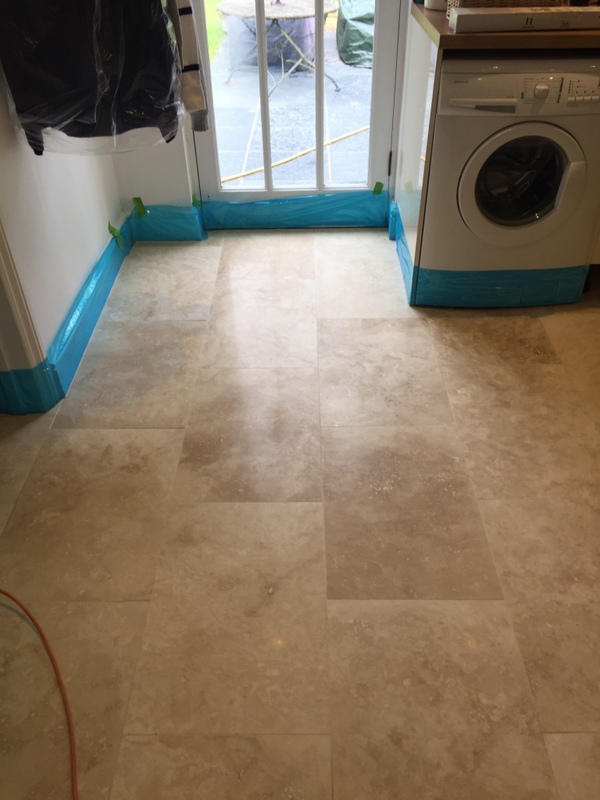 Following this I applied one coat of Tile Doctor Ultra Seal, which is an impregnating sealer, to add further protection. 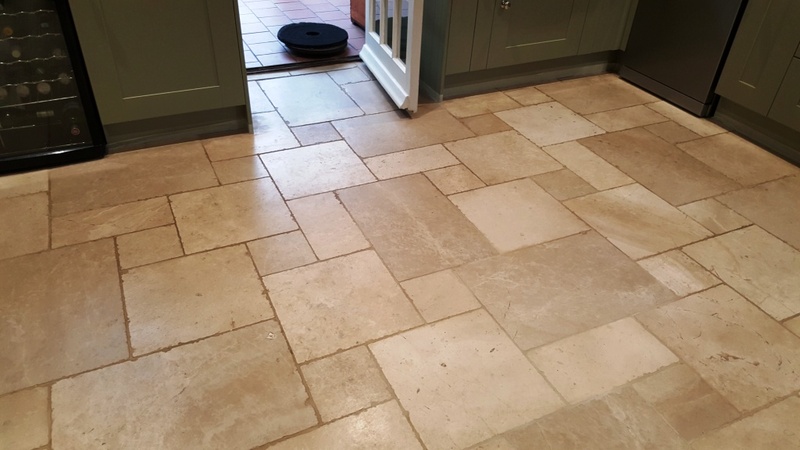 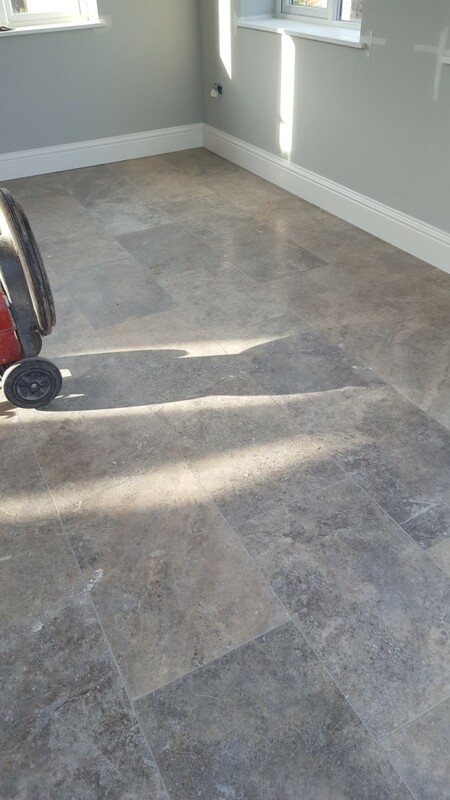 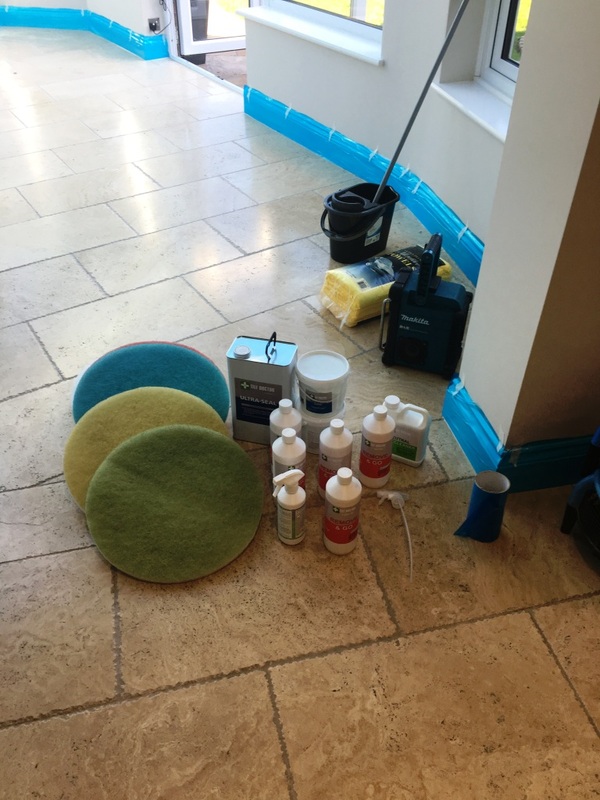 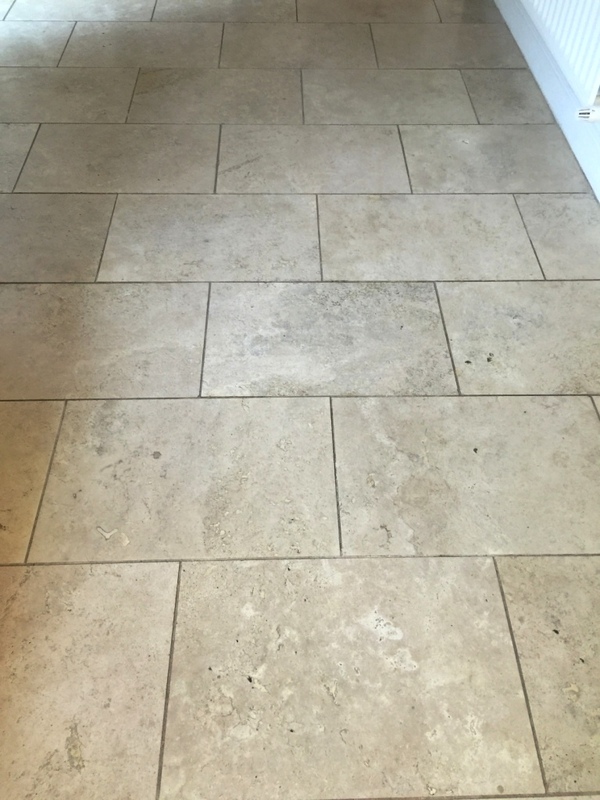 To add the finishing touches, I quick buffed the floor with Tile Doctor Stone Patina Spray, a cleaner that is designed to enhance the natural beauty and lustre of polished stone as it cleans. 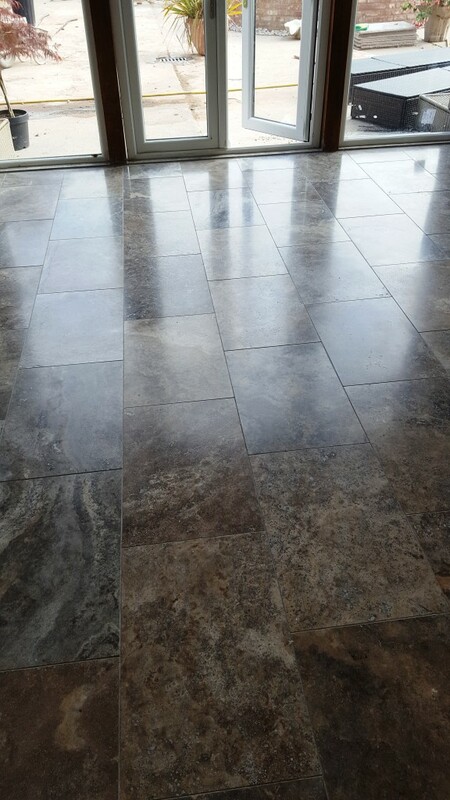 Regular use of this product helps to maintain the polished effect. 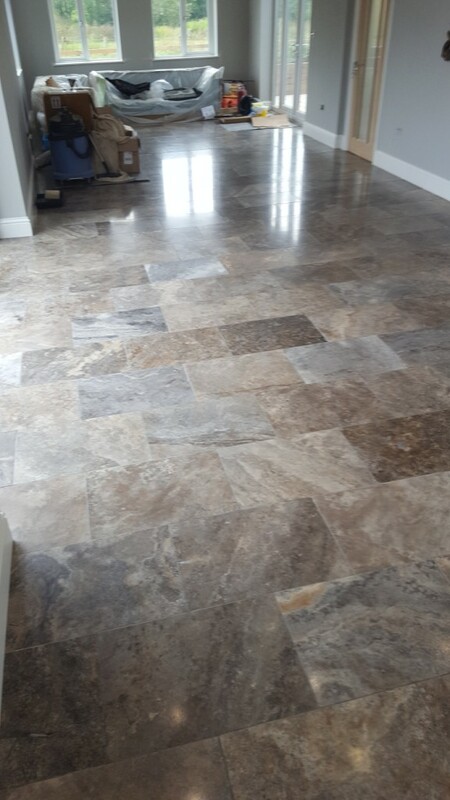 The customer absolutely loved her new floor. 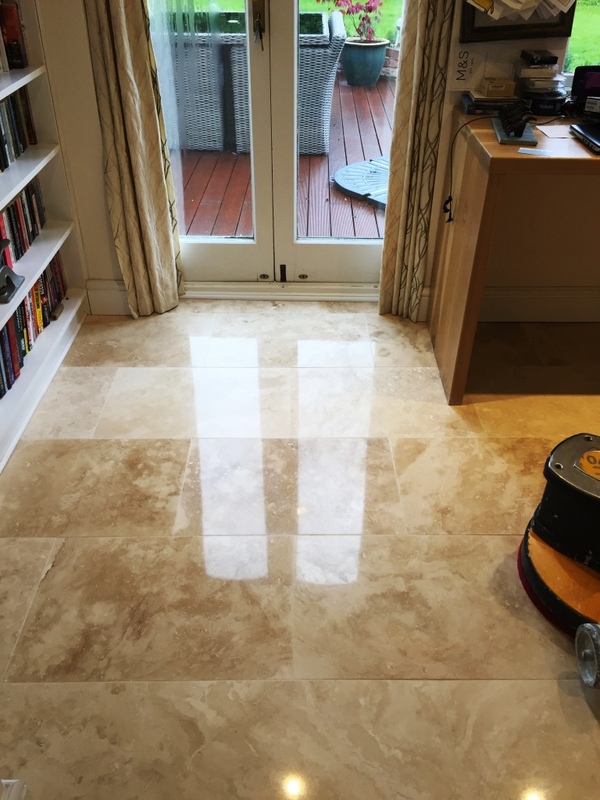 She even remarked that it looked as good as new and better than ever before.